Back on National Deviled Egg Day earlier this month, I mentioned that making deviled eggs was always one of my two annual Thanksgiving duties; the other was making cranberry-orange relish. I’ve made this relish dozens of times, and it always gets lots of compliments, even from people who don’t ordinarily like cranberry sauce. Yet it’s so simple that the instructions barely qualify as a recipe. Here you go: Pulverize a bag of cranberries and a couple of large, whole navel oranges, then add sugar until it tastes right (about a cup, maybe?). That’s it. I always used a meat grinder attachment on a stand mixer to do the pulverizing, but you can use a hand-cranked grinder or, in a pinch, a food processor (which won’t produce quite the right texture, but whatevs). 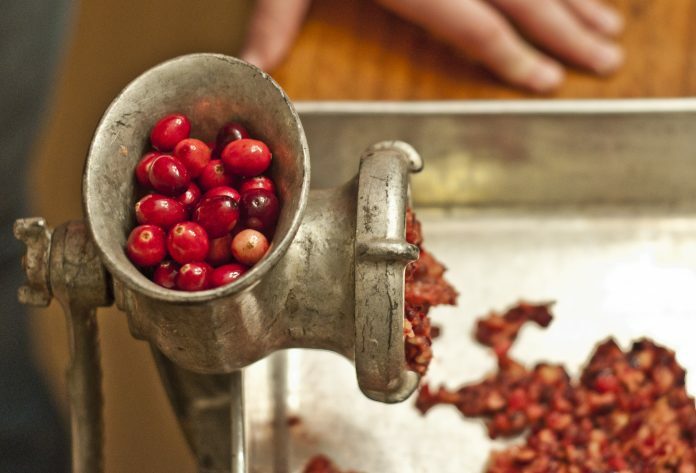 There’s no better way to celebrate National Cranberry Relish Day!